The Costa Del Sol, in southern Spain known as the (Sun Coast), has long been one of the most popular destinations for holidaymakers in all Europe. And has been high on the list of places when people are searching for a property in Spain. When you visit the region this is really not surprising to see why. 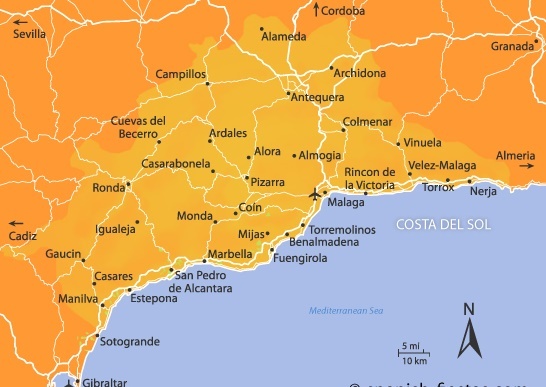 The Costa del Sol stretches over 300 kilometers, from the Strait of Gibraltar to the east to the province of Granada. The majority of the Costa del Sol, however, belongs to the province of Malaga. With the most popular airport of the region. There are the many miles of beautiful sandy beaches, The warm climate giving you an average of more than 3,000 hours of sunshine each year, the stunning Mediterranean sea, vast array of bars, restaurants, beach clubs, sports and leisure activities, as well as the largest concentration of golf courses to be found anywhere in Europe hence it's nickname Costa del Golf !. These are just a small number of reasons so many people choose to vacation and search for holiday homes here each year. Moving further to the west you will find the more well-known tourist resorts of Benalmadena, Mijas, Fuengirola and the glitz and glamour associated with Marbella. When it comes to vacations and property searches for many Marbella is high on the list, Marbella has always been home to a long history of Celebrities who reside here and can often be spotted in places such as Puerto Banus. We will be featuring over the coming weeks and months a more detailed look at the areas here in the Costa Del Sol.